A Nether base created with the new decorative Soul Glass. Smelt Soul Sand to create Soul Glass, a new decorative block that fits your Nether base better than Glass does. 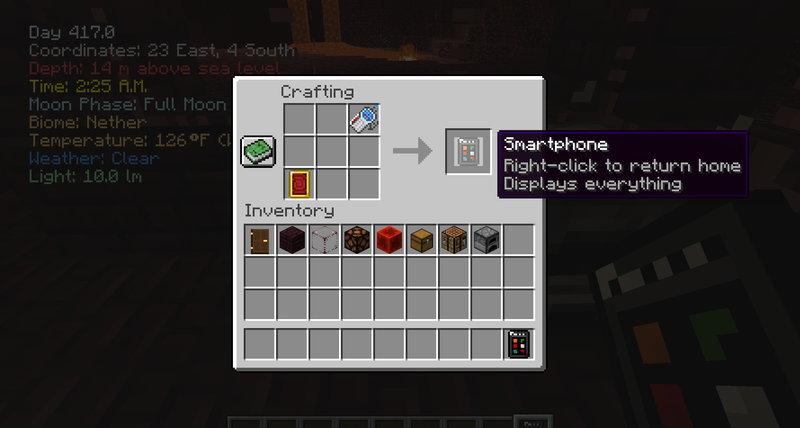 All the information you could want and more about your Minecraft world, at your fingertips. Crafting recipe for a new item, the Soul Mirror. Return home instantly from anywhere with the Soul Mirror. Crafting recipe for a new must-have tool; the Smartphone. Combine the PDA and the Soul Mirror for the ultimate must-have tool, with the functions of both. Serves as a more immersive way to get information about your world. This mod works great in conjunction with Pixelmon. 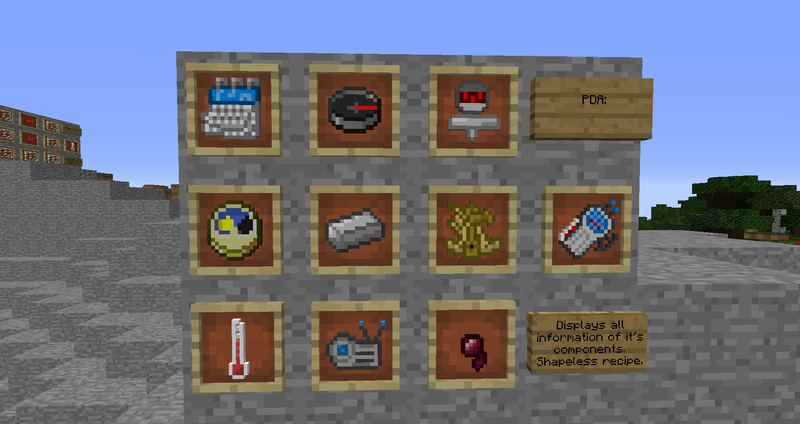 Introduces 5 new informational items that merely only need to be in your inventory to function. Adds functionality to 3 vanilla items as well. May be inspired by Terraria's informational accessories. Provides information in a helpful and immersive fashion. NEW VERSION 1.1! WHAT'S NEW?? >Check the changelog. Images updated with new items, blocks, and recipes! >The Soul Mirror will only teleport the user home if you have slept at a bed. If you haven't, you're out of luck. >The information overlays can now be toggled. The default hotkey is 'O'. In the Overworld, the Depth Gauge uses a sea level of 63 as a reference point. 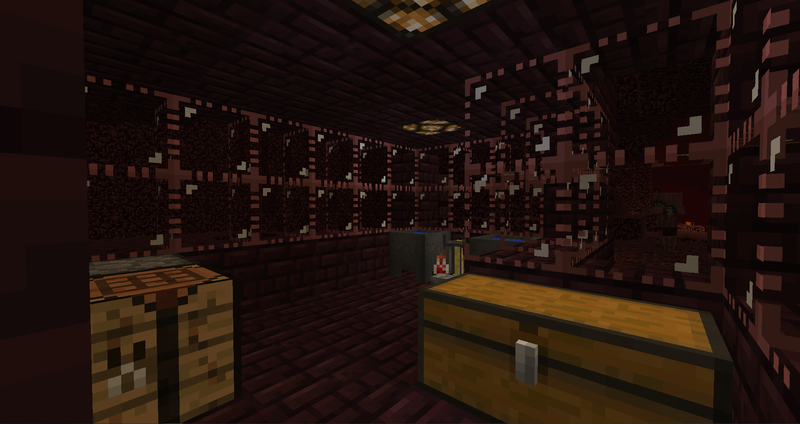 In the Nether, the Depth Gauge uses the lava sea level of 32 as a reference point. In the End, the Depth Gauge simply uses the void (0) as a reference point. Never miss another day of bountiful slime hunting with this handy tool. >Simply having a Spider Eye in your inventory can allow the player to track light levels in caves with it's photoreceptive reactions to the light. >The PDA combines all of these tools into one item so that your inventory doesn't have to be cluttered to benefit from all of the mod's tools. Mod created. Added Calendar, Sextant, Thermometer, Weather Radio and their overlays. Added new overlays for the Compass, Clock and Spider Eye. Added Soul Glass, a new decorative block from smelting Soul Sand. 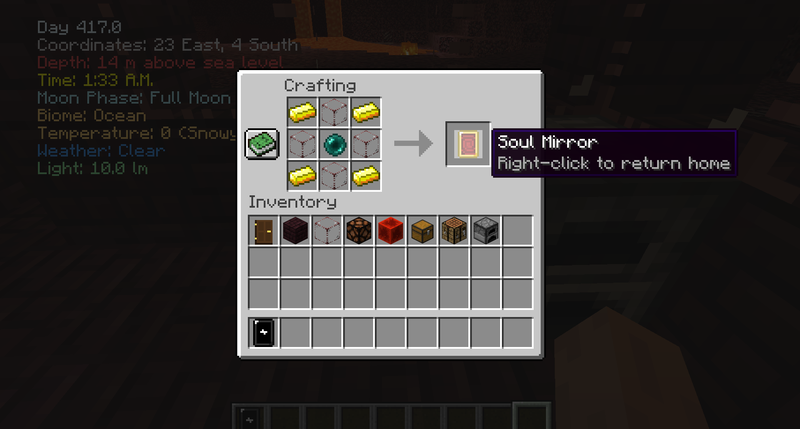 Added Soul Mirror, a teleportation item that returns the user home on right-click. Made with 4 Gold Ingots, 4 Soul Glass, and 1 Ender Pearl. Added Smartphone, which combines the functions of the PDA and the Soul Mirror. Crafted with both together, shapeless recipe. Added a hotkey to toggle the on-screen information. Default key is O. Really good idea and awesome textures. This mod has a big potential.